Prior to what it is today, Belfast Cottage was a small seasonal dwelling within a popular subdivision. The original cottage was torn down and a brand new home finished in September 2016 which still features its view of Penobscot Bay. This welcoming, two bedroom cottage is perfect for two couples or a small family looking to spend their vacation outdoors during the day, and then spending time together relaxing at night. A great starting point for trips to Acadia National Park, or Rockland, and just a few miles down the road from Belfast. With all new appliances and furnishings, the home provides simple comfort and style in a small footprint. 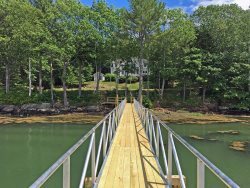 The cottage includes access to a lovely community beach that stretches along the coast of Penobscot Bay, just a couple hundred feet from the porch. The beach is great for kayaking, paddle boarding, and watching sunsets. Relax at the beach in the morning, pop back to the air-conditioned home for lunch, and spend your afternoon wandering around the quaint town of Belfast. "What a little piece of heaven! We, four of us,were here for a glorious week enjoying "our little home" with a view to die for. We have rented vacation homes all over the world but Belfast Cottage is the only one that we can call perfect, way more than we expected! We explored from Ellsworth to Boothbay and never tired of all the beautiful nooks and crannies and the awesome food at every turn. Thanks for all you have done to make our holiday the best ever." "The cottage is beautiful - bright, airy, and clean. You also thought of everything that a visitor might need! We ventured from Belfast to Bar Harbor and South to Boothbay. Stonington and Deer Island. All so gorgeous, and then home to the cottage. So inviting! Thank you very much for allowing us to stay - we truly don't want to leave!" All of the questions we asked beforehand were accurately answered. The Cottage was perfect! It was clean and well maintained. Everything we needed was there as promised and more! The process of renting, checking in and checking out was easy and quick. The one small issue we had during our stay with a mechanical problem in the house was addressed quickly and completely with no inconvenience to us. We wholeheartedly recommend On the Water in Maine. We loved our stay at Belfast Cottage. It is so comfortable, well-equipped and beautifully decorated. Our favorite part was the open concept kitchen/dining/living area. We hung out there every day and really loved it. nice clean, attractive cottage beds were extremely comfy! My interactions with On the Water staff when inquiring about properties and checking in were all positive. Staff members were polite, helpful, and clearly knowledgeable about their properties and the surrounding areas in which they are located. I wouldn't hesitate to rent from them again. Belfast Cottage was a great rental property. It has recently been updated throughout and the quality of the remodel was impressive (e.g., nice bathroom fixtures, quality kitchen appliances, thoughtful furnishings, etc.). The living room furniture was particularly comfortable, functional, and modern. The smart TV was a welcome perk to watch some Netflix before bed, and we were glad to have the A/C unit during some warmer days. Lots of windows throughout the living space allowed for great light and ventilation. The cottage is also convenient to downtown Belfast, which had lots of shopping and restaurant options. The only significant critique my wife and I had was that the mattresses were far too firm for our tastes. It may also be helpful to know that the A/C unit primarily serves to cool the living area. To cool the bedrooms, we had to rely on opening the windows and running the ceiling fans. That worked to make the rooms comfortable at night while we were there, but might be less effective if the temps were higher or if there was a lot of rain at night. Overall, we'd highly recommend this property for one or two couples, or a small family. The rental procedure was easy and went smoothly. The staff is very helpful. Absolutely perfect. Belfast Cottage left nothing to be desired. It was so beautifully designed and provided all kinds of amenities one doesn't find in a rental property.